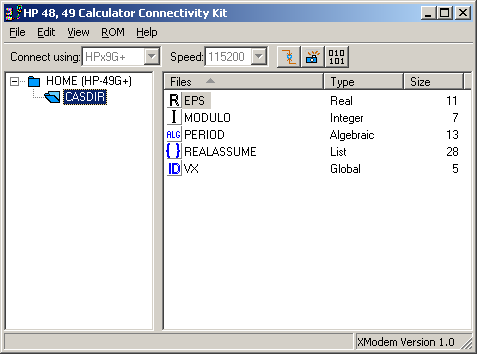 A fastXModem Connectivity Kitfor the Hewlett-Packard HP-48, HP-49, HP-48gII, HP-49g+ and HP 50g calculators. After downloaded, unzip and run HPCalculatorUSBSetup.exe and Conn4x_English.exe. Operating system: Microsoft Windows 7 (32-bit), Microsoft Windows 7 (64-bit), Microsoft Windows Vista, Microsoft Windows Vista (64-bit), Microsoft Windows XP, Microsoft Windows 2000. The HP48gII, HP49g+ and HP50g connectivity kit is design to allow you to transfer data between your calculator and your PC. With this tool, you can archive files on for safety, edit programs, text, or numbers on your PC before sending them to your calculator. The connectivity kit is also the tool that will allow you to update your HP49g+ and HP50g ROM with the latest version of the software and to download applications to your calculator. The HP48gII, HP49g+ and HP50g connectivity kit is the tool that lets your PC and your calculator become partners in helping you work better. 1. Download the updated hp connectivity kit from this page. Save the file to the desired location or choose "open" and follow the instructions on the screen. If you choose to save the file to your hard drive, locate the file and double click the HP49Gplus_HP48GII_connectivity_kit_and_USB_drivers.exe to extract the files. Accept the license agreement and follow the instructions on the screen. Go to the folder where the files where extracted and double-click the Conn4x.exe file to run the connectivity program. Below are the from the readme.txt that comes with the software. New USB drivers will be installed by SETUP. If Windows prompts for USB drivers, use the "Search for best driver" response. A copy of the USB drivers can also be found in Program filesHewlett-PackardConn4xUSBDriver. The original installable USB drivers is available from this link. Added a new feature to upload/download Text files - This is not supported by the calculator server but is done by sending various calculator commands. Files uploaded to PC in Text mode will have the extension .txt added. Files with the ASCII header "%%HP: " (newer header) or "%HPHP: " (older header) will be sent to the calculator in ASCII (Text) mode. The special flags T()A()F() on the first line of text files are checked and processed during downloads, and created during uploads. Added menu item "Copy as Text File" to Edit and Popup menus. - User has to "paste" the file somewhere (just like for binary files). "Copy" menu item now shows either Copy (Binary) or Copy (Text) to match the mode setting. Added View / Options... for setting modes for uploaded files and for setting editor preferences. TRANSIO (part of IOPAR) on the calculator has no effect on text files, mode is set under View / Options in Conn4x Upload. For downLoad, TRANSIO is not used because the file will be checked and the right translation will be done automatically. Double Click a file to edit in text mode. Default editor is Windows NOTEPAD. User may select another editor under View / Options...Directories can be copied in text mode to/from the calculator. This will include the directory and all lower level files and directories. Double clicking a directory opens the directory (instead of editing in text mode). To edit in text mode, drag the directory in text mode to the PC desktop and then edit or use the Edit Menu / "Edit as Text File" command. If you wish to embed a quote character inside a quoted string, it would be ". Likewise a backslash character inside a quoted string is . Quotes and backslashes OUTSIDE of a quoted string are just the " or character by itself, just like on the calculator. This behaviour is different then Kermit and Kermit based connectivity kits and is not backwards compatible. Conn4x will make adjustments as needed so the ->STR and OBJ-> work properly. Downloading a text file with errors may generate a "Syntax Error" on the calculator. There will be a beep, the message will show on the calculator screen for a few seconds and then clear. Whenever it is convenient, click the "disconnect" button in Conn4x. The bad text will be in stack position 1 on the calculator. The name of the bad file will be in stack position 2. If there is more than one bad file, this pattern will repeat on the stack. ALG Mode: To find the error, see "ALG Syntax Errors" in the help file. On the 48G(X), just press down-arrow). This will place the text into edit mode. cursor to the last character and delete the last quote. the syntax will be checked and the bad text will be highlighted. You may now edit the text and fix the error. When finished with the edit, press SWAP (49G right-arrow) and then STO>. Because PC File Names may not contain a and several other characters ( / : * ? " < > |) used in the Tri-Graphs, special coding has to be used when files with these names are copied to the PC. First, a ^ character is used to replace the . Second, for those Tri-Graphs that use "not allowed" characters ( / : * ? " < > |) like -> the Tri-Graph will be shown in the numeric form. This means -> will appear as ^141 in a PC File Name, for example. Conn4x allows all of the Tri-Graphs to be typed into its windows. Conn4x will do the translation to the proper PC File Name when required. The calculator checks file names and will not accept a change to a "bad" name. In Conn4x you will see that your typing is rejected and the name stays the same. It is possible to type bad file names that use the ^ or character in a wrong manner. For example: abc is not a valid Tri-Graph for a file name. In these cases, Conn4x will replace the (or ^) with a $ sign. So "Nameabc" will become "Name$abc". (See the help topic: HP Variable Names). The calculator filer can be used to give illegal names to calculator variables. Names that have mathematical symbols (like ^ * + - [ ] and many others) do not work with some calculator commands. Because of this restriction, some Conn4x operations like rename, copy, delete may not work or will be ignored or cause error messages on the calculator. Be very careful when using symbols other than letters and numbers. Read the calculator document or check the help files for naming restructions. Select Help Menu and select About. 2.3 Build 2438 - bug 1514: kit4x will show error name sometime. 2.3 Build 2437 - from build 2428, fix error message problem; switch UI language by language instead of regional/. 2.3 Build 2436 - bug 1499,1053: qsetup problem, won't fix; Bug 1497: recreate relation between code and control; bug 1498: source file error; bug 1500: length use error; bug 1501, 1502: translate file problem. 2.3 Build 2435 - modify error message problem, add Italy UI, switch UI language by Language setting instead of regional setting. 2.3 Build 2434 - bug 1499,1053: qsetup problem, won't fix; Bug 1497: recreate relation between code and control; bug 1498: source file error; bug 1500: length use error; bug 1501, 1502: translate file problem. Tagged By: Using HP50g Calculator Connectivity Kit (CONNX4), HP 48g II, HP 50g, HP 48g, HP48GII and HP49G+ PC Connectivity Kit, hp 48g plus graphing calculator, hp 49g graphing calculator, hp 48gx graphing calculator. Any updated connx4 for windows 10. I can&apos;t run the available HPCalculatorUSB setup. The calculators cable is fresh out the box. 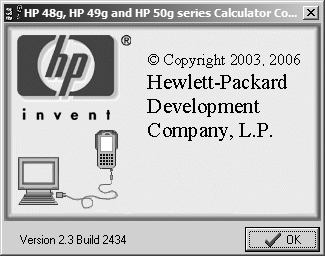 I have now tried to run it on a Windows 7 system, It does not even regonize the HP50g. I was better of with Windows XP. At least the program runs on the latter. I have used another cable and still get the same reaction. Where to now, I must be doing something wrong. I have reload and uninstalled several times already. May be time to get a TI84, that I believe works. Yes, we would like to know, How we can do it in windows 7? Hi Rafael. This software should be able to run on both Windows 7 32-bit and 64-bit. Then to connect, follow the instructions given by the Conn4x software (basically: connect via USB, launch conn4x, go to File > Connect, choose ALP, and follow the given instructions to activate the XSERV() on your calculator. Then you will be able to connect and transfer anything you want). with out success. Cannot detect calculator, yet screen download is possible.